Background: Infected pancreatic necrosis is an indication for drainage and debridement, which has traditionally been treated by percutaneous drainage or open necrosectomy. However, percutaneous drainage is often unsuccessful because of difficulty in managing the particulate debris through small catheters. Open necrosectomy involves major morbidity and a high rate of repeated surgery for abdominal sepsis. Recently laparoscopic transmesocolonic, transgastric and retroperitoneoscopic approaches have been reported. 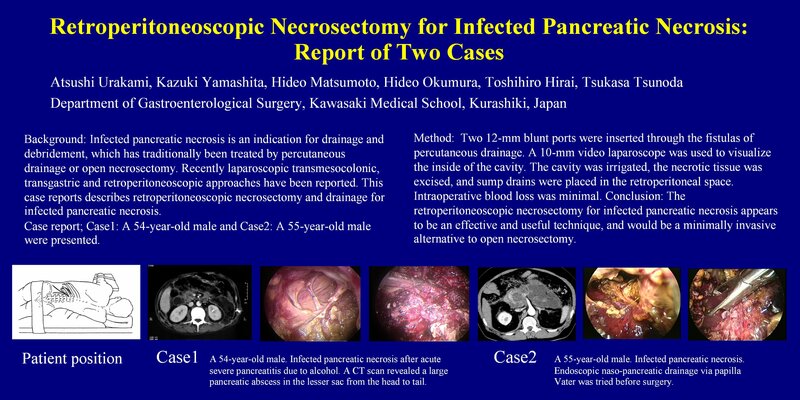 This case reports describes retroperitoneoscopic necrosectomy and drainage for infected pancreatic necrosis. Case1: A 54-year-old Japanese male was referred to our department, because of infected pancreatic necrosis after acute severe pancreatitis due to alcohol. A CT scan revealed a large pancreatic abscess in the lesser sac from the head to tail. Percutaneous drainage was performed, but his symptom, WBC, and CRP did not improve. Therefore, retroperitoneoscopic pancreatic necrosectomy was performed. Two 12-mm blunt ports were inserted through the fistulas of percutaneous drainage. A 10-mm video laparoscope was used to visualize the inside of the cavity. The cavity was irrigated, the necrotic tissue was excised, and four sump drains were placed in the retroperitoneal space. Intraoperative blood loss was minimal, and operative time was 200 min. The debrided necrotic tissue weighed 30g and was infected with Proteus mirabilis and Klebsiella pneumoniae. The patient did not require ICU stay and was given imipenem postoperatively. Irrigation via the sump drains was continued for two weeks. Case2: A 55-year-old male was referred to us, because of infected pancreatic necrosis. Endoscopic naso-pancreatic drainage via papilla Vater was performed, but his symptom did not improve. Therefore, retroperitoneoscopic pancreatic drainage was performed. Two 12-mm ports and two 5-mm ports were inserted into the retroperitoneal space, which were approached necrotic cavity throuh peri-renal space. The cavity was irrigated and three drains were placed. Irrigation via the sump drains was continued for four weeks. Conclusion: The retroperitoneoscopic necrosectomy for infected pancreatic necrosis appears to be an effective and useful technique, and would be a minimally invasive alternative to open necrosectomy.